When considering what school is best for one's children (or even when one does not have a choice and is merely analyzing the school that one's children are going to attend) one should not only ask what is being taught, but why it is being taught. In other words, one should have a rough idea of the philosophy of a school. 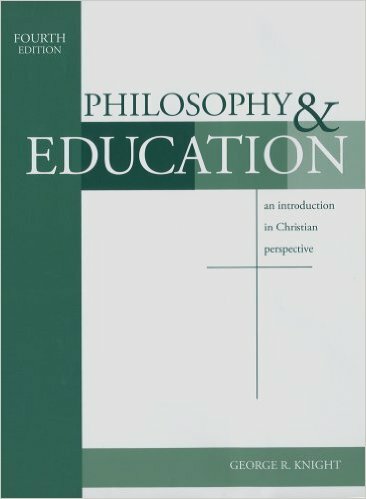 A very helpful book is Philosophy and Education by George Knight from which I draw on for a summary of the various schools of thought. Traditional educational theories set the stage for what follows. There are three main theories stressing ideas, the world and human nature. Idealism stresses ideas, thoughts and the mind through the study of the humanities, great ideas instantiated in people and cultures. Idealism sees the teacher as one who trains the student to think and passes on knowledge. Realism, on the other hand, stresses facts about the material world through the sciences. The teacher demonstrates the order of the universe through observation leading to knowledge of natural laws of nature. Scholasticism and Neo-Scholasticism both stress the nature of human beings as rational animals. Education is the process by which human beings realize the potential powers their nature offers. For example, teachers train the rational faculties through training in logic. They also train the memory and the will. Thomists also stress the training of the faculty of faith. Modern theories are similar to classical theories. However, the difference lies in a shift from the emphasis of metaphysics to epistemology. Greater stress is made on how knowledge is acquired. Pragmatism stresses experience and seeks to equip students to solve problems found in experience. Teachers are fellow problem solver whose role it is to facilitate problem solving often through projects based on real world issues. Existentialism stresses existence. Individuals are in the world to determine what they might become. Teachers enable students to discover who they are and to become all they can be. Existentialism often provides a heavy critique of other schools due to their not letting students develop as individuals. Postmodernism emphasizes language and culture as constitutive of truth. Learning is is a form of induction into an interpretation of reality and can be abused by those in power as a kind of propaganda machine. Knowledge is manipulated by power and culture. Consequently, schools are places of social construction. There are several contemporary theories of education all based, in part, upon the philosophical ideas of idealism, realism, scholasticism, pragmatism, existentialism and postmodernism. Progressivism and Humanism stress "child-centered learning", seeing the school as a microcosm of wider democratic society. The teacher is a facilitator of child development and the classroom a place to explore and solve problems. These kinds of schools lean on thought from pragmatism and existentialism. Perennialism emphasizes a return to a liberal arts curriculum and stresses the universal nature of human beings and the value of knowledge over time. They have been strong proponents of reading the "great books" of civilization. These kinds of schools draw largely on scholastic thought. Essentialism strips the role of schools down to the "basics" of the three "r"s. If students are able to perform the basics, essentialists thought, the rest will follow. Essentialism stresses discipline in the classroom supervised by a more authoritarian teacher. These kinds of schools draw on idealism and realism. Reconstructivism sees education as the means to create a new world order. The past plays less of a role in learning. Instead students are learning for change. As they become socially aware they are equipped to create a new world order focused on global issues of global warming, poverty and injustice through a global consensus. Closely related are schools of Critical Pedagogy and Constructivism. These schools of thought seek to liberate students through creating new forms of learning. Their focus is learning from those who have been socially oppressed. Emphasis in the curriculum is placed on feminism, multiculturalism and globalism. Behaviorism applies the findings of naturalistic science to the classroom. Principles learned in modern science about how animals develop are applied to human beings in schools. Teachers and the classroom environment are focused on engineering well developed students through conditioning. Many techniques used in the business world are also applied such as maximizing productivity and measuring outcomes. These kinds of schools find their roots in realism and pragmatism.